Dennis F44, Rolls Royce B81 & Allison Auto Gearbox, Surrey Fire Brigade. Photograph taken when stationed at Cranleigh Fire Station. Many thanks to Tutty of www.cranleigh-fire-station.co.uk for giving permission for this photograph to be shared (have a look at their sight for a few other pictures of classic Surrey machines). 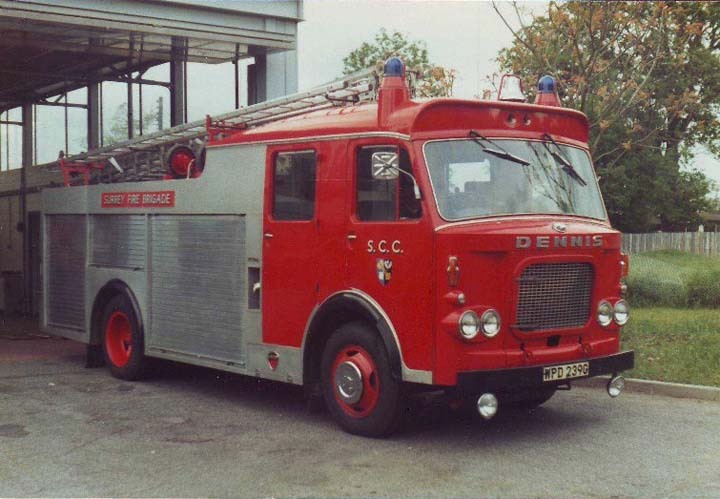 I believe that 30 Dennis F44´s were made and that Surrey Fire Brigade had at least 2 and maybe 5 of them. The bow of the front gave a great side profile. Thin, arched straps of metal gave protection to the beacons. The two horizontal bars on the left hand side of the radiator grill, were for affixing L plates. The bumper was originally in a chrome finish. I believe that, this vehicle ended it´s days parked alongside an ex Essex? Karrier and an assortment of agricultural and commercial vehicles, within a wooded area of a field adjacent to the B3000 (in between Compton & Godalming, Surrey) progressively deteriorating and failing to sell in sporadic auctions held by the owner, until one day it and the Karrier disappeared. Where did they go? For a short period I owned the sister machine WPD 236G (which was also stationed at one time at Cranleigh). I would be really pleased to hear if anyone knows of any of the Surrey F44´s where abouts. Just to confirm, the total number of the F44 model built was 27, and Surrey did indeed have 5, these being registered WPD 235-239G. Added by Ian Moore on 23 October 2007.
can you let me know if the Surrey crest and lettering are available? Added by Jason on 23 October 2007. Six F44 where supplied to the NSWFB (Australia)in 1969.I know of 3 that are still alive. Would be really interested to see a picture of those. Added by John Draysey on 16 November 2007. Added by Jez on 28 December 2007. Its in a scrapyard near me (Huddersfield) but the owner wont part with it, i've been trying to buy it for ages now. Added by Stewart Kaye on 29 December 2007. It's great to see all the interest. Special thanks to Ian for clarifying the numbers produced and Stewart for confirming WPD 236G's current where abouts (would be fantastic to see a current picture of it please). Out of interest just ran a quick search on the DVLA website on dates for road tax liability for the other ex Surrey F44's. With results as follows: WPD 235G & WPD 237G - Could not be found, WPD 238G was due on 1/1/1992 and WPD 239G on 1/7/1995. So there is some glimmer of hope that the other two may still be around somewhere. To see this machine in a subsequent guise (with thanks to David Goode) see picture #11704 of it's time with BAE. Added by John D on 16 October 2008. Dear John! Hope you don't mind me saying that picture #11704 shows WPD 236G whereas this one shows WPD 239G. Added by Chris Wood on 16 October 2008. Chris, your quite right in my excitement I confused the 6 & 9. Either way you got to love the F44's. Added by John Draysey on 24 February 2009. I recently emailed John with this information. I bought this pump direct from Surrey. It worked at the Kent and East Sussex Railway for many years as the railways pump. Sadly (I wasent driving it on this occasion as I was in my F8 YRB612), it was burnt out at a stubble fire having copped a petrol vapour lock common on B80 RR engines and failed to move when the wind changed direction. Being fibre glass she really went up only the hand bell being worth saving in the end. Added by Colin Duncan on 15 November 2009. Added by John Draysey on 15 November 2009. Correct John, just the other way around though!! 239 was mine and 238 went to BAE systems. Have a look at the F44 at Dunsfold British aerospace (also BAE) which was 236 and might just still be about. I am sure they were bought at the same time. Added by Colin Duncan on 16 November 2009. I have now been able to identify that the Dennis F44 in the field near to Compton, Surrey was WPD 235G and the Karrier that accompanied it RJN 330. Would be very grateful for any more information that anyone has. Added by John D on 17 August 2010. John, I, once owned Dennis F.44 West Sussex Fire Brigade MPO 54J. Purchased brand new by the brigade in the February of 1971 it was unique in the respect it was finished in I.C.I Coventry Fire Brigade Yellow with the rear body panelling in embossed alloy. This appliance was brand new to station 08 at Crawley and went on the run in the April of 1971 as first pump. it then went on to serve at the following stations Crawley/Steyning/Horsham/Brigade Training Centre/Chichester/Bognor Regis finally being withdrawn in the December of 1984. it went to Auction at Frimley and was sold to a company called Cranleigh Ariels in Surrey where it was parked in one of the Directors Gardens for eighteen months, sold for scrap, I, recovered it and spent a lot of money and time on it and it was based at Littlehampton in West Sussex. In 1997 I decided to take the ill fated and deeply regreted decision to sell it as I had the constant worry of storage and fee's it was sold to a South Coast Family who had very exciting expectations of putting it back on the road. they all had the very attractive Marcel (french) Blue flashing lights chrome based two were changed to the Lucas acorn style due to branch breakages. So where have they gone? DBP 12G was sold with GBP 446H at Frimley Auctions in the December of 1984 from here they went to a Southampton Scrap/Ferous Metal Merchant at the Dockside he ran DBP for some time to fetes and West Country Rallies but unable to sell on broke the two up the following year. MPO 54J we know about, MPX 589J was sold to Killicks Ferous Metals near Hailsham East Sussex and was for a very long time parked up in his yard in the corner he finally broke it up in 1988 for scrap. These appliances were based on a bodywork design by the City of Coventry Fire Brigade (F.43Bs-F.36s) but during construction had it revised to incorporate an open Ladder access at the rear not as with Coventry fully enclosed. They operated from brand new with the 464 Ladder not as many persons have claimed with a wheeled Escape although the rear layout was designed to incorporate a wheeled Escape in event of the Lacon/464 not proving itself operationally in its early years from here the Brigade went to the Dennis F.49 WrL at Shoreham Worthing Horsham and the red liveries were back commencing in late 1971. The F.44s were supplied to West Sussex/Surrey/Essex/Liverpool/ and of course overseas Australia and I think South Africa. Added by BOB CARVER on 18 August 2010. Added by Dave Crowe on 02 January 2014. Is MPO 54J still in the south of England? Be interested to know if it's still saveable. Added by on 01 February 2015. Dennis F.44 has survived but is totally unrestorable and unsaveable. The rear end has rotted right out, and many many parts have gone missing. it is in a hell of a state and will be cut up for scrap. What a shame I should never have sold it more fool me I should have carried on and persevered with the restoration all of the hard and complicated work I had done and found somewhere to keep it shame on me! to anyone out there believe me it is beyond recovery I had not seen it for some years and was very sad when I did. Added by BOB CARVER on 04 February 2015. If MPO 54J has not yet been scrapped, could you please tell me where it is, as I would like to see it. I am currently living in Littlehampton, and I believe it is/was somewhere close. Added by Bill Edwards on 04 June 2015. Good news! MPO 54J has been bought by an enthusiast in West Sussex with the intention of fully restoring it. Unfortunately it has been systematically stripped and replacement parts are proving very hard to find/obtain. It is indeed in a very sorry state of repair and will require a lot of hard work to achieve his ultimate aim. Should anyone have any information relating to spares availability, he would be very interested to know. The owner does not have Internet access however, I would be more than willing to liaise on his behalf. I am sure he willing for you to see it, please contact me if you are interested as it is indeed very near to you. Added by Dave Stevens on 19 February 2016. Delighted it has been purchased - someone obviously likes a challenge! - I have some old Cine film of me sitting in it at a Worthing open day when it was with the Brigade Training Centre and I was about 7 years old. Hopefully one day it will be restored and can be paired with MPO 55J for a photo. Added by Jon Godden on 27 February 2016.